StockCharts Record High Percent equals new 52-week highs divided by the sum of new 52-week highs plus new 52-week lows. This breadth indicator shows when new highs outnumber new lows and when new highs are expanding. New highs outnumber new lows when the indicator is above 50. New highs are expanding when the indicator is above 50 and rising. Update Frequency: End-of-day (EOD). These indicators are updated after the market close, usually by 6:00 PM ET. 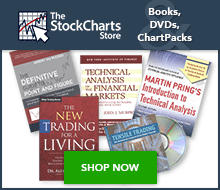 StockCharts uses a three-step process to calculate breadth indicators. First, StockCharts maintains component lists for these indices. Second, our scan engine uses these component lists to run scans based on the price data for the individual stocks. Third, the data is updated and published to our website. The chart example below shows Nasdaq 100 Record High Percent ($RHNDX) as the gray line, a 20-day moving average as the red line and the Nasdaq 100 in the bottom panel. Chartists should consider using a moving average to smooth the data, as Record High Percent can be a volatile series. The Nasdaq 100 was added because it is handy to plot the underlying index along with the indicator. StockCharts.com users can access an up-to-date list of symbols for all our Record High Percent Indicators. From this list, click the “Mentions” icon to the right of a specific symbol for more details about the symbol, as well as recent mentions in Public ChartLists, blog articles, and more.